VIENNA, VA--(Marketwired - Dec 10, 2013) - Just 10 miles from Washington D.C., this premier Tysons Corner hotel is perfect for stays long or short. 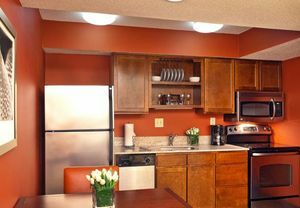 Whether you're planning a long vacation or a training seminar, or looking for temporary or corporate housing, this Tysons Corner Residence Inn is the perfect spot. Some guests find the newly renovated, spacious all suite guest rooms more comfortable than home: all have sitting areas and full kitchens, TVs with cable and premium movie channels, and most rooms even have a fireplace. Guests can even bring their pets for an additional fee. Room sizes vary from studio suites to executive suites and 2-bedroom suites. The executive suites are especially convenient for business use as they have a separate meeting area with a conference table, perfect for small meetings. Complimentary Wi-Fi is available throughout the hotel to maximize productivity, a 24-hour market is located in the lobby, and guests even have access to the hotel's grocery shopping service. Every morning of every stay at this Vienna area hotel means a complimentary hot buffet breakfast so you can start your day off right. If you're in a hurry, a grab-n-go morning meal is available instead. Extended guests especially appreciate all that there is to do on-site and nearby, so that downtime before and after meetings is enjoyable. For those looking to work out in their spare time, there is a fully equipped exercise room and a whirlpool onsite, as well as a seasonal outdoor pool. Added hotel perks include complimentary evening socials several nights a week, with refreshments, and convenient access to the nearby Tysons Corner Center and Tysons Galleria shopping complexes, which are home to some of the country's best retailers and restaurants. It's just a short drive to Virginia's wine country and Civil War Battlefields -- either make for fun off-site adventures -- and all that Washington D.C. has to offer is just 10 miles away. It's easier than ever to book rooms for groups or events and it can all be done online. Business travelers and conference goers appreciate the full-service business center and the outdoor courtyard and grill area are perfect for group events and picnics. Conveniently located near the Washington D.C. area's most popular business and shopping centers, this newly renovated Residence Inn at Tysons Corners is an all suite property ideal for families, groups, extended-stay needs or those simply seeking the added luxury of space. Pet friendly, the hotel is located just a short drive from Washington D.C. and many of the area's cultural and historical attractions making it an ideal destination whether planning a world-class shopping extravaganza to the Tysons Center Galleria, a leisure tour of local sights or an important business venture. The executive suites are especially convenient for business use as they have a separate meeting area with a conference table, perfect for small meetings.